The Alaska World Arts Festival Guide will be included as a high-quality insert in the June 2019 special edition of Coast Magazine (13,000 copies) with an independent overrun based on festival registrations. 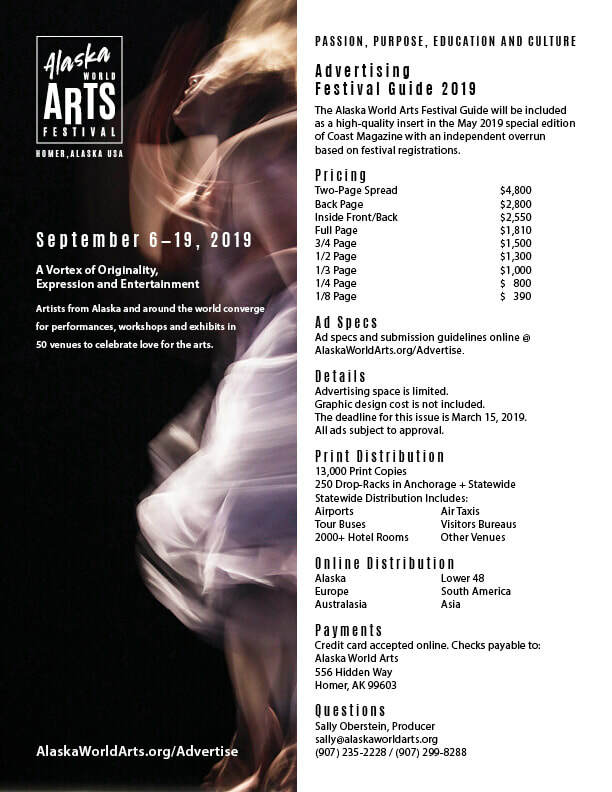 Download our Rate Sheet and Ad Specs + Guidelines below for detailed information on how to purchase ad space for the Alaska World Arts Festival Guide. both online and in our hard copy Festival Guide. AD SUBMISSIONS ARE NOW CLOSED. Using the information from our Ad Specs + Guidelines above. Select your ad size and price from one of the two drop-down menus below. By submitting your ad purchase, you will be guided to a payment page. Your ad purchase is not complete until we receive your check or credit card payment.